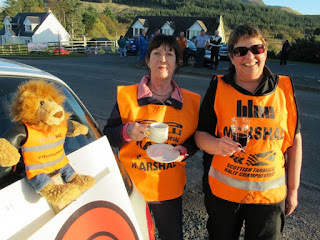 There will be another opinionated missive from a certain columnist and contributor in tomorrow's (Wed 18th) 'Motorsport News', this time the subject is Marshals. There have been many initiatives over the years, with prize draws, voluntary contributions and buying a breakfast to show our appreciation. And yet, methinks we need to do more. Perhaps we could take inspiration from that long remembered and well respected humble man of the people, one David Cameron Esq who urged us all to "hug a hoodie", maybe we need to "mollycoddle a marshal". On the other hand, getting embraced by a hot and sweaty driver might not be the most appreciated act of endearment to these vital sporting accessories. It might even be misconstrued as an infringement of personal space, unwanted attention or maybe even a sexist act, depending on the gender of the driver and/or Marshal. Yet another example of political correctness gone mad. Maybe just a handshake will do, eh? Anyway, the peripatetic ramblings of the sage from far beyond Englandshire will be in to-morrow's publication to the nation.